The Gilded Stage: A Social History of Opera by Daniel Snowman – …the first book to see the entire history of opera from the perspective of the ‘demand’ rather than the ‘supply’, the consumption rather than the production. Daniel Snowman explores the world of opera houses and impresarios, monarchs and money makers, artists and audiences. 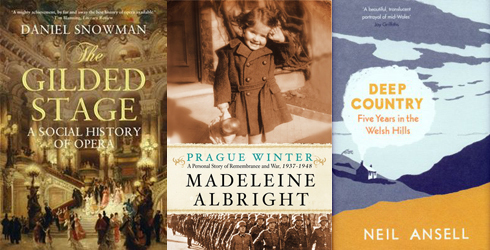 Prague Winter: A Personal Story of Remembrance and War, 1937-1948 by Madeleine Albright – From former Secretary of State Madeleine Albright comes a moving and thoughtful memoir of her formative years in Czechoslovakia during the tumult of Nazi occupation, World War II, fascism, and the onset of the Cold War. An intensely personal journey into the past that offers vital lessons for the future, Prague Winter combines the intimacy of an autobiography with the drama of an exciting and well-told story—all underpinned by the gravity and intelligence of a serious work of history. I always save your library loot posts as they are always brimful of the best! the Madeline Albright one is specially intriguing. Memoirs and particularly those of immigrants are very interesting for me. Thank you, Mystica! I’m really excited about the Madeleine Albright memoir since it combines both an era I’m interested in – WWII – and a place I cannot read enough about – Czechoslovakia. I agree with Mystica — your library loot posts are always great (or, depending on one’s perspective, terrible) for my TBR lists. The Gilded Stage looks fascinating. Thanks, Jordan! And I apologize for the damage I’m doing to your TBR list – the same thing happens to me when I read through everyone else’s Library Loot posts. I have Prague Winter waiting for me at the library! I’m really excited to start on it – it looks promising! Still reading Rosie Thomas’s The Kashmir Shawl. But would like to mention a first novel written by a friend. It’s just been published and it’s called To Turn Full Circle and it’s by Linda Mitchelmore. I read this as Linda was writing it and it’s an excellent story set in South Devon, England, in 1909. So I will be reading that soon, in published form, a s a p! Congratulations to your friend, Margaret! It must be so exciting for her to see her work in print. Enjoy your reading! I don’t read a lot of non-fiction but all three of these look really good! I’m excited about them all! I’m joining Mystica and Jordan in telling you how much I look forward to Library Loot. 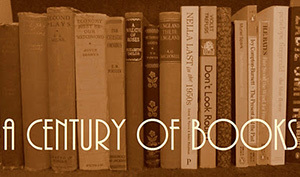 The first thing I do when I see it is to open up my library’s website and start reserving books! You’ve given me so many good ideas of books to read. Many thanks. And thank you for that lovely comment! It is very exciting to know that my picks are encouraging others to use their libraries even more! I have to agree with the above comments. Very seldom I don’t add something to my TBR. Enjoy your loot! It seems to take me longer and longer to get to my favorite posts these days! So it goes . . . I’m really interested in Madeleine Albright’s memoir. I just saw her in an extensive interview on C-Span’s BookTV a few days ago that was about an hour long, as those things go, and it was quite in depth about the book. As always, all your “loot” looks intriguing. I just brought home the first Maisie Dobbs AND a beautiful volume called The Angel Tree: Celebrating Christmas at the Metropolitan Museum of Art along with One Writer’s Garden: Eudora Welty’s Home Place. A treat for the senses. It sounds like a wonderful program, Penny. Albright is such a fascinating woman and I am really excited to start reading Prague Winter. Your books this week all sound great, especially One Writer’s Garden – but when have I ever been able to resist a book about gardens? Enjoy!